Located on the corner of Powerscroft Road and Lower Clapton Road, the Old School Rooms are right next door to the Round Chapel. The Old School Rooms house three different sized rooms, each with wooden floors and lots of natural light. 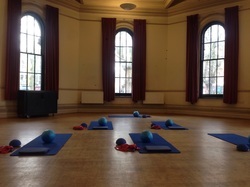 They make for a perfect and convenient location for Pilates classes and have been added due to the popularity of My Local Pilates classes at nearby Chats Palace Arts Centre. The entrance to the Old School Rooms is at the side of the building, on Powerscroft Road and around the corner from the Round House itself (pictured). Thursday classes are upstairs in the Church Room, across from the main hall. Please use the MAIN ENTRANCE, up the stone steps. Monday evening classes now take place in the downstairs Nursery Room. Come DOWN THE STEPS to the right of the main steps and press the buzzer for the Nursery. The teacher will let you in.